Labor Day is long gone, but that doesn’t mean you can’t still enjoy the delicious fruits of summer. Our new tea here at the Mad Hatter celebrates summer because it’s all about the fruity taste of guava. Have You Tried Guava Tea Yet? Tropical and pleasingly astringent come to mind after sipping this wonderful new tea. In the development of this new tea, I was inspired by many scrumptious meals I've enjoyed over the years at a local Puerto Rican restaurant. Guava is a common ingredient in the foods of Puerto Rico, which brings me to another reason for introducing this tea at this time. In September, Hurricane Maria barreled toward Puerto Rico and struck the island, leaving destruction and devastation in its path. Communications were crippled, homes destroyed, and much of the island is still without power seven weeks later. I can’t do much from here other than donating to hurricane relief, but one thing I can do is help maintain Puerto Rico’s presence on the minds of anyone who cares to buy my teas. This is yet another reason why the release of my Guava Tea is timely. Hurricane Maria was seven weeks ago but the struggles continue for the people whose lives were impacted by this catastrophic storm. As the holiday season rolls in, let’s not forget our brothers and sisters in Puerto Rico, whose holiday season will be disrupted in more ways than we can ever know. Guava Tea is a reminder of the lovely island of Puerto Rico, its lovely people and its culture, all of which we know will persevere beyond the current struggles they’re experiencing. If you’ve been pining for a real European-style afternoon tea service in North Carolina, then you absolutely have to head to the Fearrington House in Chapel Hill. You may already know about the Fearrington House’s luxurious, serene, and peaceful atmosphere. But you may not know that the Fearrington House Restaurant also offers an Afternoon Tea service by reservation only. 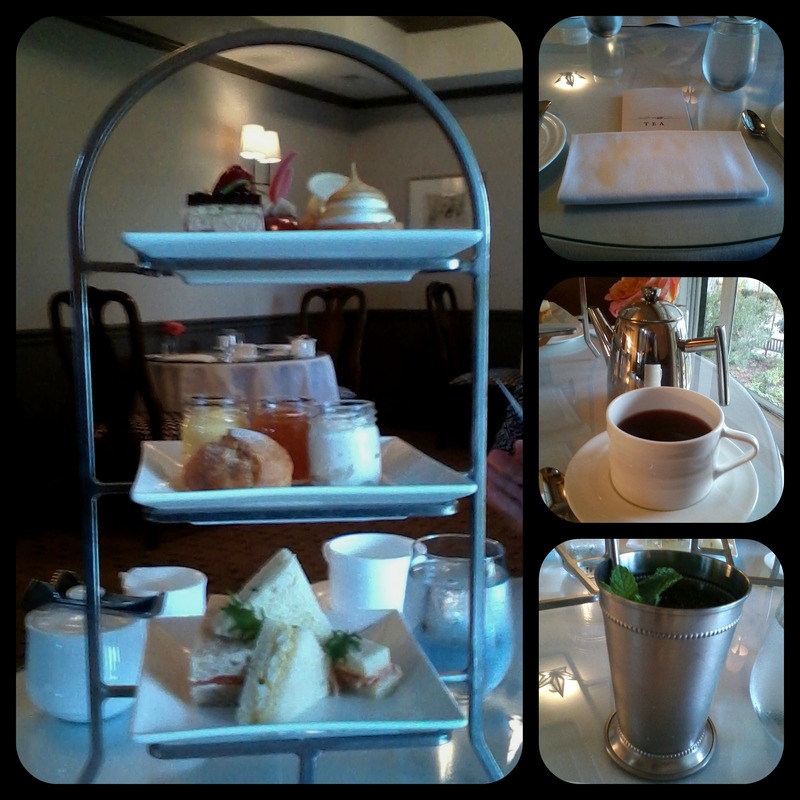 First of all, the pastries and tea sandwiches were amazing. Afternoon tea includes four tea sandwiches (my favs were the ham/pimento cheese tea sandwich and the cucumber tea sandwich), one scone and five desserts. I also ordered a mint julep, served in a mint julep cup with tiny sprigs of mint. My friend ordered the Fearrington House’s Milk Punch, and it was extraordinary! We also had the choice of a fantastic selection of teas, all of them Harney & Sons. I picked the raspberry tea and it was perfect! Plus, it was the most beautiful color. The tea selection is small, but there are choices that should appeal to everyone. The tea menu is divided into two sections: “Loose Leaf” and “Herbals & Infusions.” There are all the tea classics on the menu – such as Earl Grey and English Breakfast. My friend chose the decaffeinated Darjeeling and was pleased with her selection. Secondly, the ambience is simply incredible. The owners have outdone themselves in creating a real English tea experience. Afternoon Tea is served upstairs at the Fearrington House and you have a great view of the grounds. In our case, we could see a wedding party gathering together for photos. If you enjoy posting photos on Instagram, you’re practically guaranteed some great pics that will have everyone thinking that you’ve taken a trip across the pond to Europe! Finally, it was really all the little touches that made the difference. One of my favorite parts of the Afternoon Tea is that each person receives their own three-tiered serving stand. If you bring young children, they also get a serving stand – which makes them feel very special, almost as if they are grown-ups! In fact, the Fearrington House menu refers to young children as “Prince” and “Princess.” What a nice touch! It is well worth a visit with a friend to enjoy this time-honored tradition. With a few exceptions, the experience was simply sublime. One of these exceptions was that we were not given a fork, and really needed one for the desserts. Another minor issue is the layout of the tea room itself. One of the storage rooms is upstairs, and staff members occasionally walked by us to take chairs in and out of the storage room. However, on the whole, the Fearrington House has done a remarkable job of creating a real English Afternoon Tea experience. Plus, as a bonus, we visited one of the shops while there and discovered lots of great gifts. We could even hear one of the beautiful goats making what could best be described as delightful goat sounds as we walked around the premises. In short, Afternoon Tea at the Fearrington House Restaurant was a wonderful experience with great ambience and even better food. I’m planning on going back soon, and if you’re in the Chapel Hill area for the holidays, it’s definitely worth a visit. In Rockabilly lore and in the South, blue suede shoes symbolize something that’s new, exciting, special, and different. Elvis Presley sang a song about them, and we’ve named a tea after them. That was Elvis alright, bringing a new rhythm to American teenagers who craved something different from the music of their parents’ generation. And he sang Carl Perkins’ song, which was about the most special pair of shoes a man could own. Made of blue suede, they were completely impractical and not at all easy to clean—but treasured because they were so special. I’m no Elvis Presley but I’m bringing in something special, new, exciting and different too. 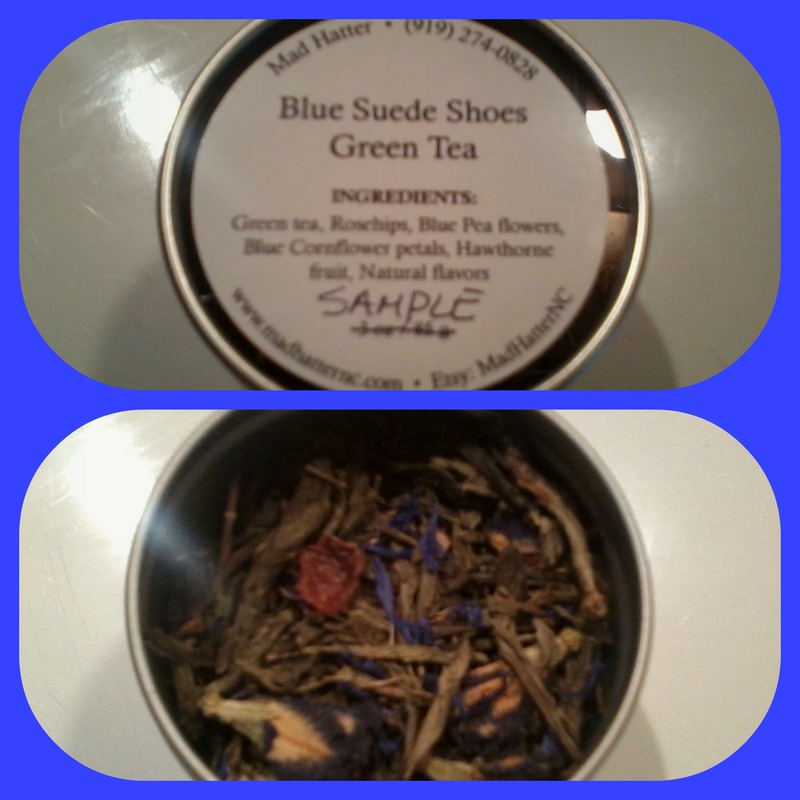 The newest addition to our lineup of teas at the Mad Hatter is called ‘Blue Suede Shoes’. Like the blue suede shoes worn by the mythical crooner in the famous song, this tea is infused with special qualities that may make you want to sing. Carl Perkins, who wrote the song that Elvis made famous, never wore Blue Suede shoes himself. But he knew they were something out of the ordinary. That’s how we feel about this tea, and here’s why we think it deserves such a striking name. This is a green tea made delightful by Blue Pea Flowers and Blue Cornflower petals. Infused with these colorful petals plus Rosehip and Hawthorne fruit, it has a smooth sweetness that, for some tea drinkers, will require no additional sweetener. For anyone who loves iced tea, Blue Suede Shoes Tea tastes especially smooth over ice. In fact, lots of our customers prefer it that way (but they will tend to add sweetener when it’s iced!). And of course, it’s fitting that a tea inspired by footwear that originated in the South should be served in the Southern way! We’ve come to love this newest tea in our lineup, especially as the dog days of summer continue on into September here in North Carolina. We’ve been sipping it iced and sweetened every day on our porch as the afternoons extend into the evening. For us right now, there will be no substitute for the mild, fragrant taste of Blue Suede Shoes Tea. Like Carl Perkins wrote and Elvis sang, ‘you can do anything but lay off my blue suede shoes’! As you know, the local version of The Mad Hatter came to an end this past July. It was the final chapter of the physical shop but by no means the end of the Mad Hatter shop. We’re continuing online and we’ll still be in town for special tea parties and other fun events. But we couldn’t let the shop go out without a final send-off, so we decided to go literally mad for a day and just give it all away. Literally, we opened up the doors and just invited people in for a free-for-all! In the retail world, that is the very definition of ‘Mad’! Subscribers to the Mad Hatter email woke to find a special message in their inboxes. We’d sent out an announcement saying that day would be ‘Free Day’ at the Mad Hatter and they’d better hurry down before everyone else got wind of the event. The email worked, and soon our friends and loyal customers were trickling—then pouring—into the shop to see what was what. Some seemed to think maybe it was all a joke. How could anyone give away their shop? But once our friends and customers walked through the front door of the shop and realized Free Day was no joke, they joined in the fun. Everyone was picking out what they wanted: teas, lotions, soaps, hat boxes and yes… hats. Bobbie really hates moving! Since the Mad Hatter was closing down, the shop had to be completely emptied. The prospect of moving everything was just too much for this Southern lady and her crew so we came up with the idea of Free Day. Plus, it was our way of thanking our loyal local customers for years of fun and support. We were thrilled that so many of you got to take home some great products and we had a fun day on top of it all. Believe it or not, there was still some merchandise left in the shop at the end of Free Day! And since Bobbie really hates packing, we called a local thrift store that raises money for autism. They came and picked up the rest, thereby ending the final phase of Free Day at the Mad Hatter. Thanks, Everyone, For Making Free Day a Success! We met our goal and emptied the shop on Free Day. But the real reward was seeing our customers once again, and knowing we provided some items they’ll enjoy. That, more than anything, means a lot to us here at the Mad Hatter… because without our local customers, we never would have arrived at the place where we are today. We hope everyone continues to stay in touch with us, either by visiting us online to read our blog or by shopping our online shops. See you soon! We're Closing Our Doors- But Opening New Ones! This week marks the end of the Mad Hatter storefront in Fuquay-Varina, North Carolina. And while we’ll miss our cozy little downtown spot, we’re truly excited about the next phase: a 24/7 e-commerce storefront where we can spotlight our products to the world. So we’re not thinking of this as an end. We’re not even leaving Fuquay-Varina behind. Rather, we’re taking Fuquay-Varina and the Mad Hatter out into the world. Our local shop is now part of the global marketplace and we can’t wait to tell the world about our community, our products, and the lovely network of customers who’ve been with us all along. In fact, it’s our customers—both local and those visiting from distant regions—that we owe everything we have. So this is not about closing our physical doors. It’s about thanking our customers and inviting you to come along with the Mad Hatter on a journey into the global stratosphere. We’ll still be posting customer photos, so watch for the Mad Hatter community to grow in the upcoming months ahead. You can still find Mad Hatter teas and lotions, only now they’re conveniently showcased on our new Etsy store (MadHatterNC). As for our hats, you can still visit us online at www.MadHatterNC.com to do your window shopping and get ideas before you make a purchase. The blog will live on, too. And for all our customers in Fuquay-Varina, stay tuned for a revival of the Mad Hatter Tea Society! Whichever way you choose to connect with us, we look forward to seeing everyone again. Thank you, everyone, for making the Mad Hatter everything we are today. We couldn’t have done this without you. Here’s to our journey together as we enter the next phase of Mad Hattery. One of the best ways to enjoy a leisurely afternoon is by treating yourself to a good cup of tea. If you’ve been lucky enough to sample high-quality teas from around the world, you know the distinct pleasures of a good Earl Grey. We’ve added two new tea blends to our tea lineup here in the shop. Both are variations on Earl Grey. 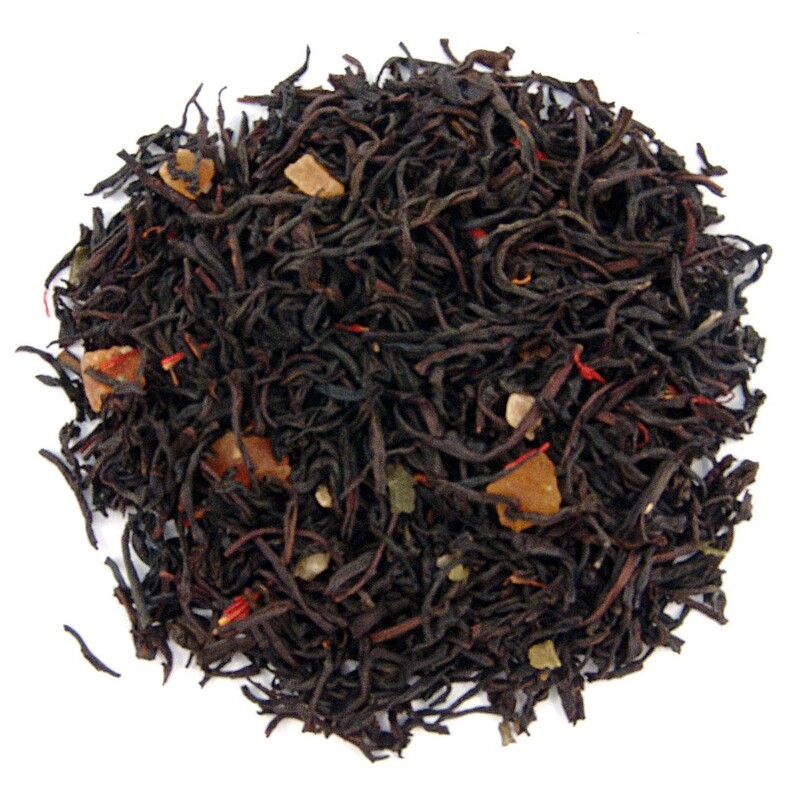 In case you aren’t familiar with Earl Grey, it’s a blend with a very distinctive flavor. That flavor comes from the bergamot oil, which is derived from the rind of the bergamot orange. The result isn’t what you’d describe as ‘orange-ey’, though. It’s more like an exotic, delicious twist on black tea. What’s more British than Earl Grey tea? Earl Grey tea served at a garden party! We know the Queen is a huge fan of tea, and this one, with its soft notes of Jasmine, seems perfect for an afternoon tea at her palace. In fact, she does serve this blend at her annual garden party at Buckingham Palace. It’s a unique blend created just for that occasion, with green tea as well as black tea. Now it’s available at the Mad Hatter, too. If you’ve ever visited the Mad Hatter, you might have noticed that we’re a big fan of Duchess Kate. There’s no better ambassador for hat fashion, of course. She does for hats what Brigitte Bardot did for the bikini. Or what Audrey Hepburn did for the little black dress. And more specifically, Duchess Kate has introduced millions of American women to the the special magic that comes from wearing a perfectly placed fascinator. 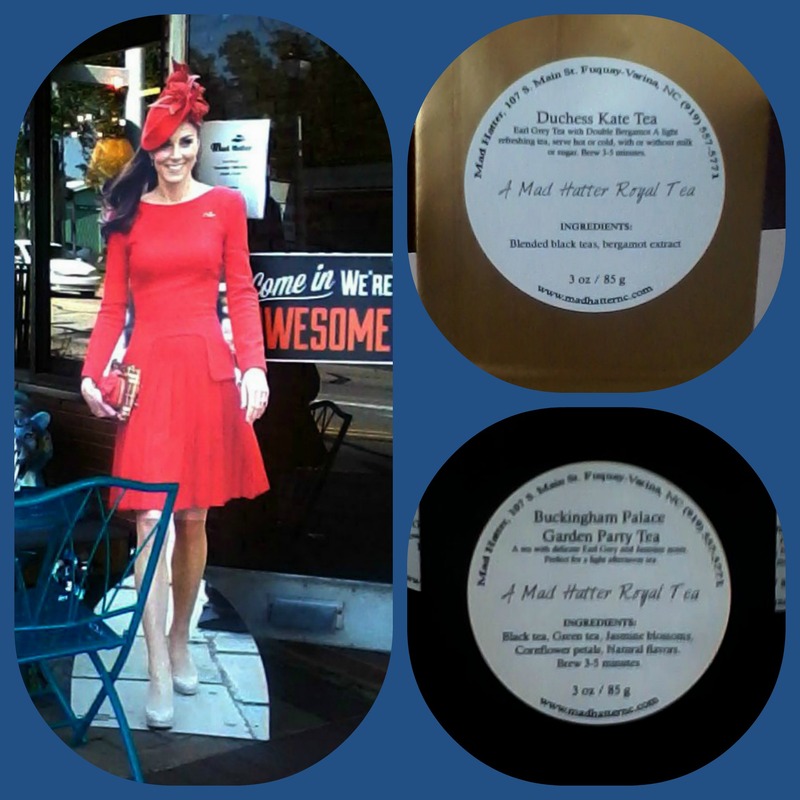 We’re such a great fan of Duchess Kate that we named our second new tea after her. As far as we know, nobody else has a Duchess Kate Tea! Just like her youthful spirit and her impeccable sense of fashion, this tea is light and refreshing. It can be served hot or cold, with or without milk and sugar. The secret to our Duchess Kate Tea is the double bergamot, which gives the tea a truly rich, exotic flavor. You don’t have to be a Duchess or a Queen to enjoy the finest Earl Grey blends. They’re right here at the Mad Hatter. Next time you’re in the area, stop by for one of our new tea blends and say hello. Preakness Season is here. The annual Spring racing fashion event is May 20. Ladies, if you’re heading up to Baltimore to attend the races, it’s time to start thinking about your wardrobes. And of course, the most important part of your look is your hat. But just like the other horse racing events this Spring and Summer, you can’t wear just any old hat. There’s an unwritten ‘code’ to the hat styles women wear. Here’s your basic guide to what type of hat to wear to Preakness Stakes and all the other exciting horse racing events you plan to attend this year and beyond. If you were just at the Kentucky Derby, you’ve got a good sense of what women are wearing this year. As far as hats go, what works for the Kentucky Derby also works for Preakness. There’s definitely a color theme for the Baltimore race, however: Black-Eyed Susan colors! Even a touch of yellow will show you’re in the spirit of the day. There are several advantages to wearing an oversized hat. One very practical reason is that those wide brims cast a shadow and will protect your face and shoulders from the Baltimore sun. Secondly, think of an oversized hat as a canvas. The larger the hat, the more embellishments it can hold! Race Day hats are best when fully decked out with flowers, but you can venture into the unexpected and get creative. If you’re going to wear a hat (I suggest you do, for the sun protection alone), there’s no reason to be shy about it. Part of the charm of attending a horse race like Preakness Stakes is that everyone’s decked out. Once the day is over, you can revert to your normal wardrobe but for race day, it’s a fantasy land of hats and dresses and seersucker suits. So, that gigantic hot pink hat that seems like overkill while running errands will fit right in at the races. For some, the opportunity to wear a fascinator is too tempting so for race day, that’s their choice. Also acceptable! 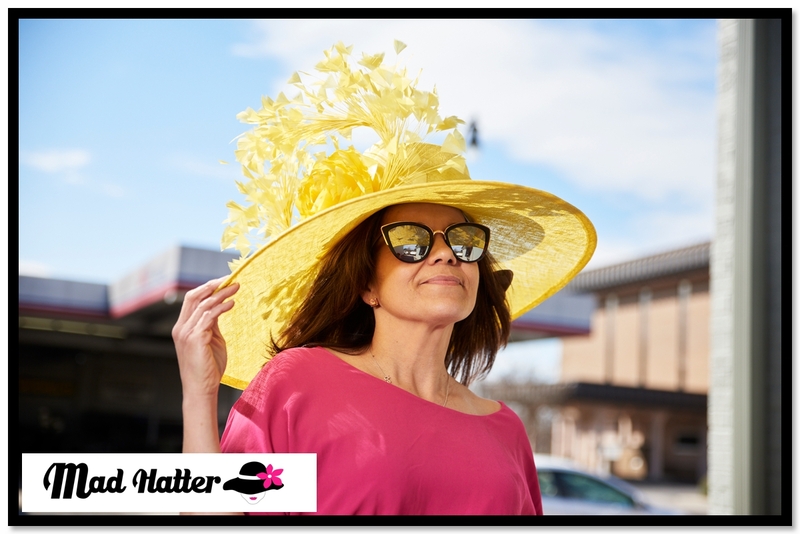 You may not get the full benefit of sun coverage, but there is an advantage of the fascinator over the oversized hat. With a fascinator, you don’t have to worry your hat is going to blow away. Fascinators can be secured with bobby pins for a footloose and fancy-free day at the races. And that’s how we hope you feel as you attend the races: like you don’t have a care in the world except making sure you get a good view of the race. 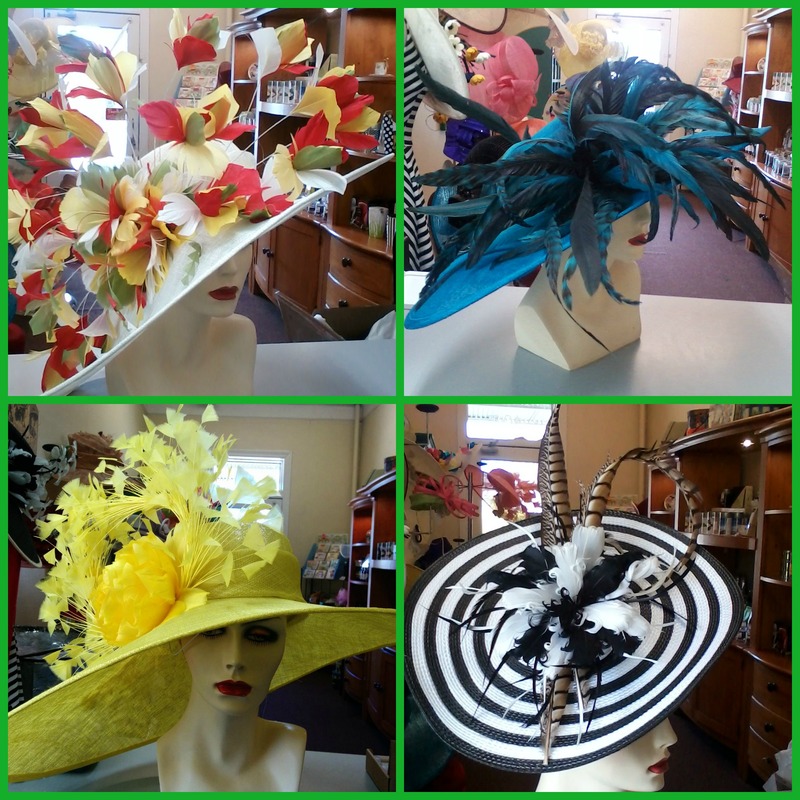 Stop by the Mad Hatter and we’ll get you set up with your new Preakness Stakes hat. Who’s going to the Kentucky Derby? We’re in full throttle here at Mad Hatter, helping friends and customers get ready for the hat event of the year. Millinery fans know hat season begins in early Spring and lasts well into late summer but the high point is the Kentucky Derby. Why all the fuss and fanaticism? To help explain the special mystique of the Kentucky Derby for fashion fans, here are three reasons why we love the Kentucky Derby. The Kentucky Derby is a famous horse race, of course. But to some, it’s all about the hats. Top names in fashion arrive all decked out in outfits that were obviously created around the hat. It’s a virtual showcase of the world’s most beautiful hats! It’s not every day that you get to dress up and wear a stunning hat. If you’ve ever been to the Kentucky Derby, you probably noticed that some people really go all out with the creativity. The Kentucky Derby hat scene is special because it’s a temporary fantasy land for people who love to dress up in fancy hat-based ensembles. Creative types can indulge their wildest hat creation fantasies. Conservative types can let loose with a little creativity. It’s a chance to live in a different world for a fleeting moment. Did you know that the Kentucky Derby was established by the grandson of famous explorer General William Clark? Like his grandfather, Col. Meriwether Lewis Clark Jr. loved to travel. After attending horse races in England and France in the 1870s, he returned to America to start his own race*. The problem was: American ladies at the time tended to steer clear of horse races. They associated the events with drinking and gambling. So, to pull in the ladies, Clark made his Kentucky Derby a fashion event, too. He required “full morning dress”, which meant hat and gloves. The rest is history. As a result, he required “full morning dress”, which meant hat and gloves. The rest is history. Mad Hatter is the acknowledged hat expert in the Fuquay-Varina area. Our customers know there’s no substitute for a well-made hat, and they can rely on us for a carefully-curated collection of beautiful hats for any special occasion. Not only that, but we know and love hats- come by the shop to see our latest collection. But hurry- most are Kentucky Derby-bound! Anyone Up for a Garden Party? Every year in June, there is the Miss NC Garden Party. Hosted by the Miss NC Scholarship Pageant Organization, at William Peace University again this year, the party will have a featured speaker and 45 Miss North Carolina contestants on hand with their friends and family. Also in attendance will be the Scholarship Donors, who set a record this year of a whopping $80,000. The new Miss North Carolina for 2017 will receive a $20,000 scholarship. The featured speaker, Tycely Williams, was the first runner-up in 1997 and she will touch upon highlights from this year’s theme: You Don’t Have to Wear a Crown to Be a Winner! Crowns Not Required, But Hats are Encouraged! 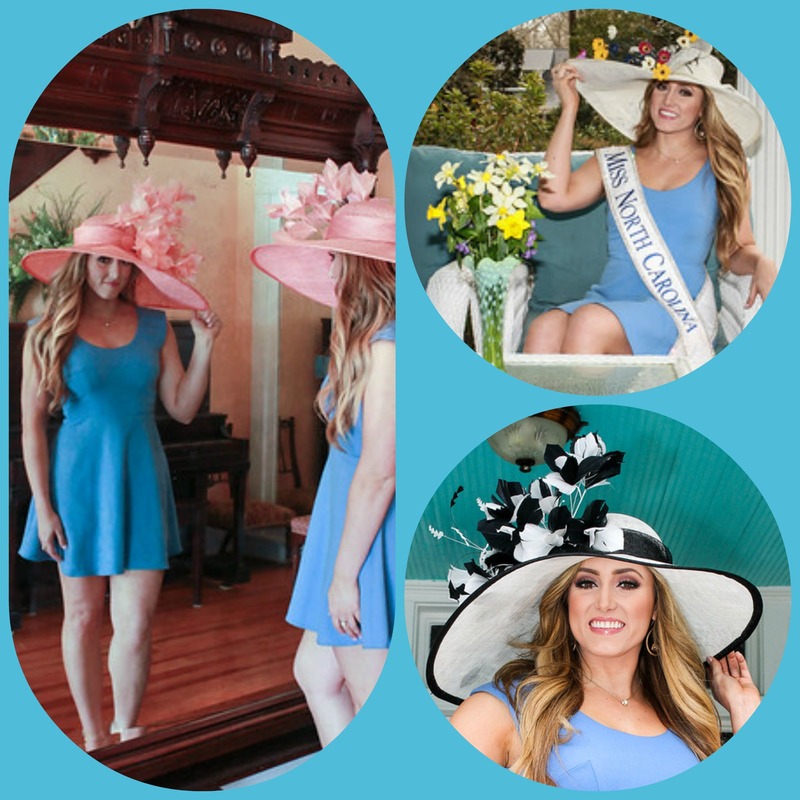 You may not have to wear a crown to be a winner, but all invited guests should be inspired to don pretty Spring hats. And if a hat isn’t your style, then a fascinator suits the occasion just fine, too! To kick off all the pre-party fun, the Mad Hatter was host to none other than Miss North Carolina herself, McKenzie Faggart. We had a blast snapping pics of her in all the new Spring hats we have in the shop. Such a fun day with a truly wonderful gal – I couldn’t wait to share these pictures with everyone. We also took some of the hats from the shop to the Walter Aiken House in downtown Fuquay-Varina, where the historic backdrop made the hats look so special. Of course, having Miss North Carolina wear the hats made the hats look pretty special too. My favorite is the monochrome peach/coral hat in front of the grand old mirror at the Walter Aiken House. In case you haven’t noticed, peach/coral is a very big color this Spring and we’re seeing it everywhere – from sneakers to garden hats! Thanks, McKenzie Faggart, for spending the afternoon at the Mad Hatter- it was so much fun, and what a way to get ready for Spring! Are Your Going to the Garden Party at the NC Azalea Festival? This crazy, cold winter will soon come to an end, just in time for the NC Azalea festival on April 5-9. Here at the shop, our favorite part of the lineup of events is, of course, the Garden Party at Airlie Gardens. Have you ever been? Around here, we don’t need any excuse to don our Spring hats. Just a tiny break in the weather is all it takes and already, many members of the Mad Hatter community are already planning outfits to go with new hats. But the Luncheon Garden party at the NC Azalea Festival is Spring’s first official calling to bring out the new styles and show our colors. I’ve sent many hats to the festival: many of my customers love the Garden Party and attend year after year. 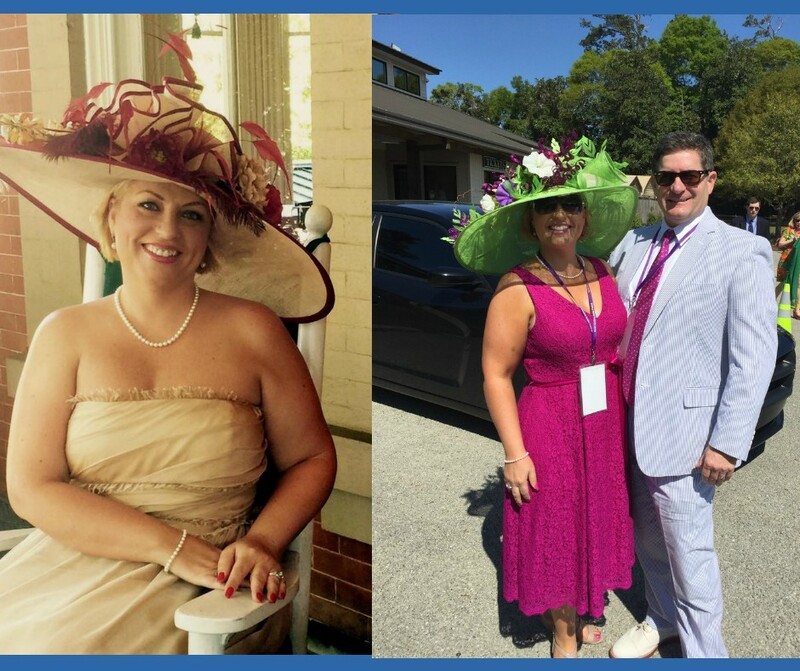 One of my proudest moments was when I sent this lovely creme and burgundy garden hat (flowers added after purchase) to the festival (see photo below), worn by one of my lovely customers with a matching creme-colored strapless ruffled dress and pearls (how Southern!). The ruffles were carefully chosen, I imagine, to mirror the ruffles on the hat itself. I’m not sure where she found such a perfect dress, but I’m pretty sure she turned a lot of heads that year! Another year, that same customer chose a green and fuchsia color scheme (fuschia and white was added to hat after purchase) but kept the same extremely wide brim style. Personally, I favor that style too, as it shades not only the face but also the shoulders from the sun. And for the shoulder-baring styles this lovely lady chose, it was a wise choice, as the Spring sun shone bright and clear both years. Something to think about if you’re planning on attending this year. It’s not only great fun but also an important networking event and a place to see and be seen. While women come in big fancy hats, men attend in their best Southern seersucker suits and bow ties (or ties). A whopping 2,500 people kick off the season at this party, too. That’s a lot of hats to take in and a lot of people to rub elbows with! There’s also the Citadel Summerall Guards performance, which you can catch if you get there early enough. Are you headed to Wilmington on April 5-9 for the NC Azalea Festival and the garden party at Airlie Gardens? Stop by the Mad Hatter and we’ll find you the perfect, show-stopping hat!